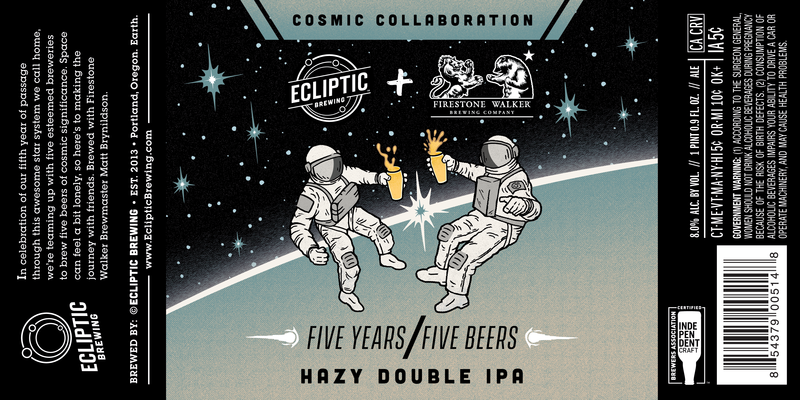 For its second beer in its 5 Years/5 Beers series of beers, Ecliptic Brewing has collaborated with Firestone Walker Brewing on Cosmic Collaboration Hazy Double IPA. 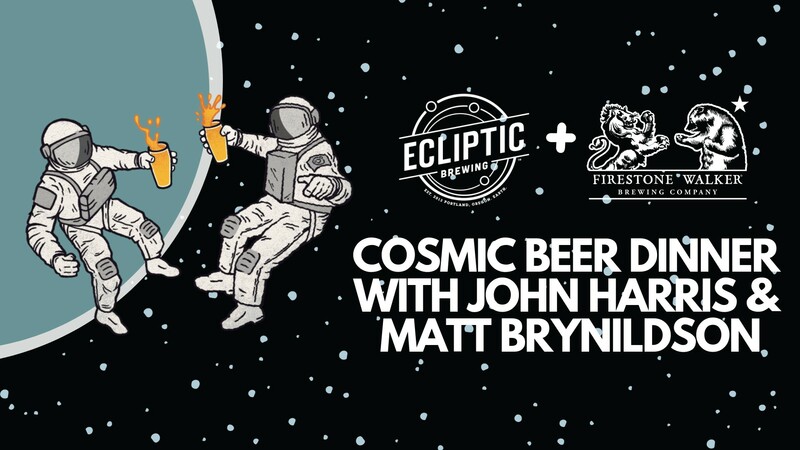 To celebrate this new bold yet juicy and hazy IPA, Ecliptic Brewing will host a Cosmic Beer Dinner on Wednesday, April 24th beginning at 6:00pm. The featured hosts of this brewer’s dinner will be Ecliptic Brewing Brewmaster, John Harris, and Firestone Walker Brewing Brewmaster, Matt Brynildson. The dinner will feature a menu from Ecliptic Brewing Chef Michael Molitor, each paired with delicious beers from both breweries. The ticket price includes 5 courses, 9-5oz beers, gratuity, and a 500mL bottle to-go of the Cosmic Collaboration Hazy Double IPA signed by the brewmasters! Cosmic Collaboration Hazy Double IPA is the second of five beers in the Ecliptic Brewing’s 5 Years/5 Beers Cosmic Collaboration Series that celebrates the breweries five years orbiting the sun. Hazy Double IPA is brewed with pale malt, wheat, oats, along with Idaho 7, HBC 692, and El Dorado hops to create an IPA that’s hazy, big and full of juiciness that sits at 8% ABV. “I feel very honored to have Matt and Firestone Walker on board to help us commemorate our anniversary,” said Harris in a statement. Matt Brynildson pouring Krieky Bones at Big Beers, Belgians & Barleywines Festival. 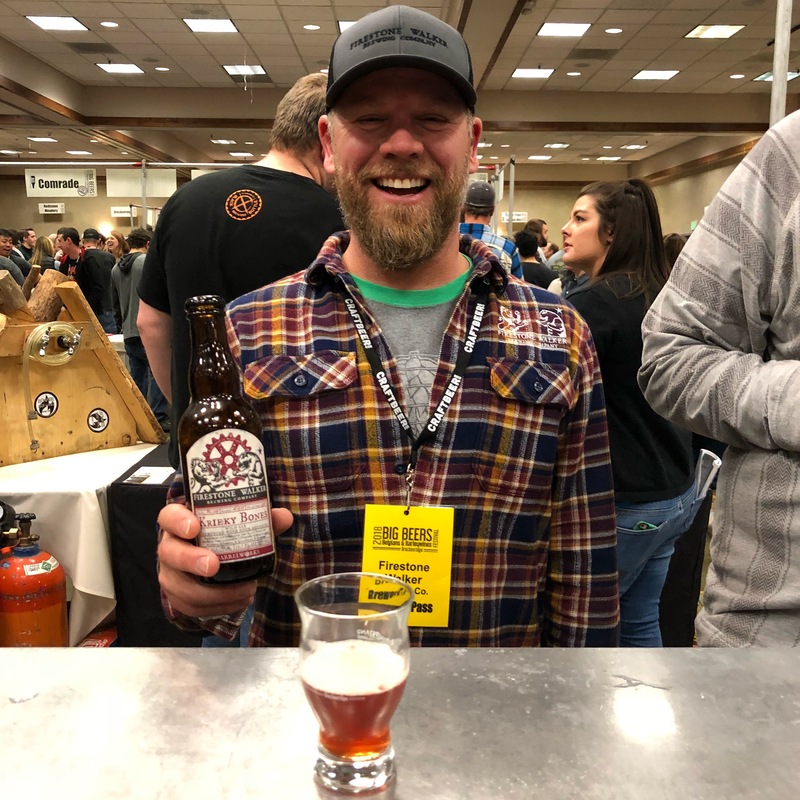 He will be in Portland for the release of Hazy Double IPA, his beer he collaborated with John Harris on at Ecliptic Brewing. If the Cosmic Collaboration Brunch that took place in February with is any indication of the great food, beer and conversation that was had, this upcoming dinner will surely be one not to miss. Tickets for the Cosmic Beer Dinner are $65.00 ($70.02 after fees) and can be purchased online by clicking HERE. Here’s a preview of the spring vegetable derived beer dinner. 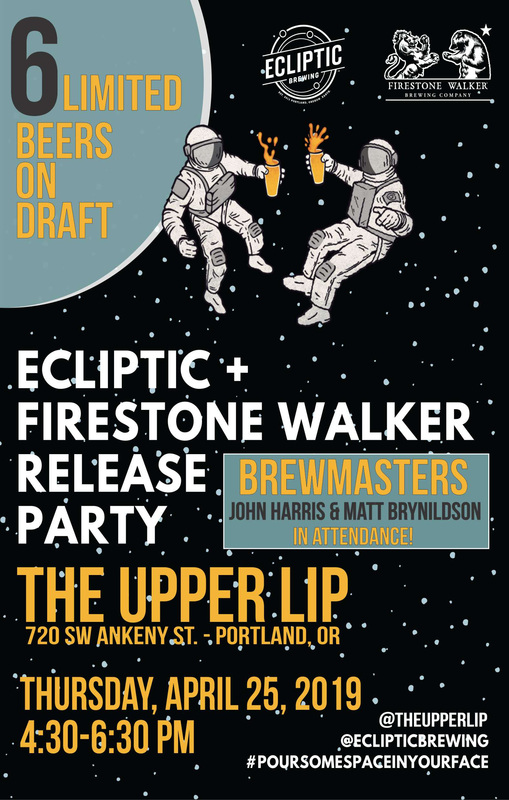 The following night on Thursday, April 25th, The Upper Lip will host the Hazy Double IPA Release Party featuring a tap list from both Ecliptic Brewing and Firestone Walker Brewing. Be the first to try the Hazy Double IPA, a Cosmic Collaboration with Ecliptic Brewing and Firestone Walker Brewing. Meet Ecliptic Brewmaster, John Harris, and Firestone Walker Brewmaster, Matt Brynildson, who will be in attendance from 4:30-6:30pm.